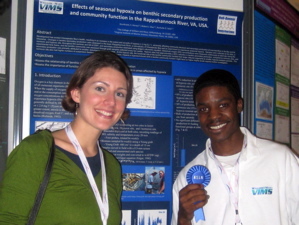 VIMS grad student Kersey Sturdivant has won an award for Best Student Poster Presentation at the recent annual meeting of the American Society of Limnology and Oceanography (ASLO). The award recognizes both the scientific merit of the research presented, as well as the knowledge and poise of the presenter. ASLO is the leading professional organization for researchers and educators in the field of aquatic science, with more than 3,800 members from 58 countries around the world. The meeting featured more than 100 sessions of poster presentations. Sturdivant’s poster described initial results from his Ph.D. research at VIMS with co-advisors Bob Diaz and Rochelle Seitz. Their research focuses on the effects that low-oxygen “dead zones” have on bottom-dwelling organisms in the Rappahannock River, a major tributary of Chesapeake Bay. The Rappahannock is known to suffer from seasonal bouts of low-oxygen water, or “hypoxia,” primarily during summer. Sturdivant is studying how the scarcity of oxygen in the river’s bottom waters during the summer months affects the organisms that live on and in the muddy seafloor. These organisms are a key part of the Bay’s food web, supporting recreationally and commercially important species such as crabs, striped bass, croaker, and spot. Sturdivant compared samples of bottom-dwelling organisms collected during the spring, summer, and fall of 2007 with simultaneous oxygen readings from nearby waters. His findings show that low-oxygen sites produce 60%-90% less food energy compared to well-oxygenated sites, and that low-oxygen communities tend to be dominated by small marine worms that are likely more difficult for predators to find and consume. The ASLO meeting was held in Nice, France. The venue reflects the increasingly international make-up of ASLO membership, and the increasingly global nature of marine science issues such as hypoxia. The meeting was sponsored by ASLO in conjunction with the Villefranche Oceanography Laboratory, the Scientific Centre of Monaco, the IAEA Marine Environment Laboratory, the Laboratoire de Biologie du Développement, ECOMERS (Ecology of Marine Ecosystems and Responses to Stress), the Centre National de la Recherche Scientifique (CNRS), Institut National des Sciences de l'Univers, European Space Agency (ESA), EAWAG, Université Pierre et Marie Curie-Paris, Université de Nice, Communauté Nice Côte d'Azur, Mairie de Nice, and Institut Océanographique Paul Ricard.